I have been thinking quite a lot recently about the type of historic events we choose to explore (and in some cases commemorate). This was spurred by the recent laying of a wreath by the Irish President Michael D. Higgins to the memory of the San Patricios, the largely Irish group who deserted from the U.S. Army to fight with the Mexicans during the Mexican-American War. The story of the San Patricios is a fascinating one and is certainly worthy of exploration. It has proven a popular topic in Ireland both in terms of memory and commemoration. In an Irish context, the San Patricios fit within a broader narrative of fighting for the side of ‘right’ against overwhelming odds, a popular theme in Irish memory. In contrast, as part of the force of the aggressors, the Irish in the U.S. military have received virtually no attention. Despite their being perceived as being on the ‘wrong’ side, I am nonetheless struck at how little time is spent pondering the lot of the vast majority of Irishmen who remained in U.S. uniform during the Mexican War. As emigrants during the era of the Great Famine, their experiences might be expected to be of interest, from a social history perspective if nothing else. Why were these Irishmen in uniform? What were their motivations for enlisting, and why did they stay? Little work is being carried out in Ireland on the hundreds of thousands of Irishmen who served in the U.S. military during the nineteenth century. Outside of the American Civil War many of these men were engaged in fighting either Mexico or Native Americans. Particularly in the case of the latter, this brings with it an element of shame in modern Irish memory. Irish participation in wars against Native Americans does not sit well within a broader narrative of Irish people struggling against oppression. To modern sensibilities it often seems incongruous that these Irish could be both victims (as in the case of Famine emigrants, for example) and aggressors. Of course, many of the Irish who served in the U.S. military in the nineteenth century were economic emigrants, who had little choice but to seek a new life in America and to earn a living as best they could. It is my view that the Irish who served in the nineteenth century U.S. military are victims of the artificial break that exists in Irish history, where the stories of those who emigrated are no longer relevant. This has been overcome in certain circumstances (such as with the San Patricios) where later actions are seen to have a resonance with a wider Irish historical narrative. However, the Irishmen who charged into Black Kettle’s Camp on the Washita are disassociated from Irish history, and also from the wider reality that many were Famine emigrants. 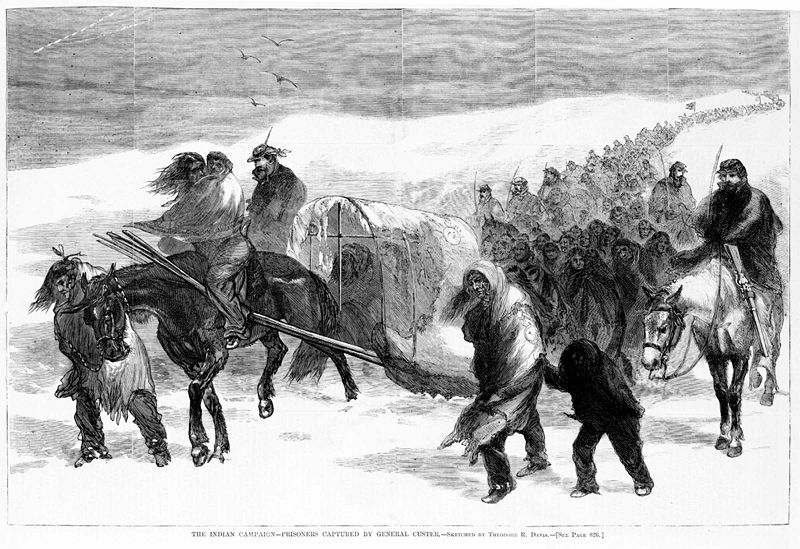 Today we look with horror at the way Native Americans were persecuted in the nineteenth century. Incidents such as the Wounded Knee massacre are rightly remembered as some of the darkest in American history. Should we study the Irishmen who served in the U.S. military at this time? Should we remember them? Some Irishmen in the Plains Wars do receive attention, notably those who died with Custer at the Little Big Horn in 1876. A previous post on this site has looked at the 25% of Fetterman’s annihilated force that were of Irish birth. There is no doubt that many of the Irish who fought in the U.S.-Mexican War, American Civil War and Native American Wars viewed themselves as racially superior to non-whites, views that we find difficult to understand today. However, this was not unusual for the period. It is probable that many men in units such as the San Patricios held similar views. The only way we can hope to gain a real picture of these Irish is to study them. 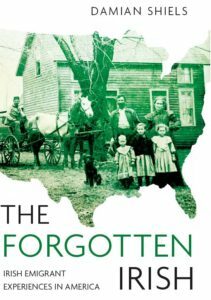 Many were simply in search of a livelihood- some of those who died in the Powder River Country with Fetterman in 1866 had not been in the United States for long, finding themselves transposed from rural Ireland to the alien landscape of the Plains. Michael Regan, the 28-year-old former carpenter from Sligo, had been in the army only three months when he died at Wounded Knee in 1890. 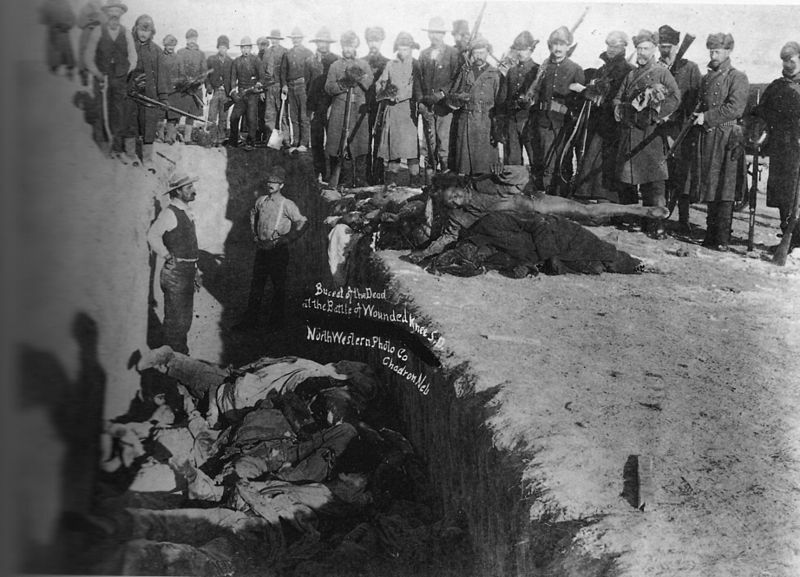 Two of the most controversial engagements in which Irishmen were involved during the nineteenth century were the Battle of the Washita (sometimes referred to as the Washita Massacre) and the Wounded Knee Massacre. The battle at the Washita was fought on 27th November 1868 in what is now Oklahoma, while the Wounded Knee massacre occurred on 29th December 1890 in South Dakota. 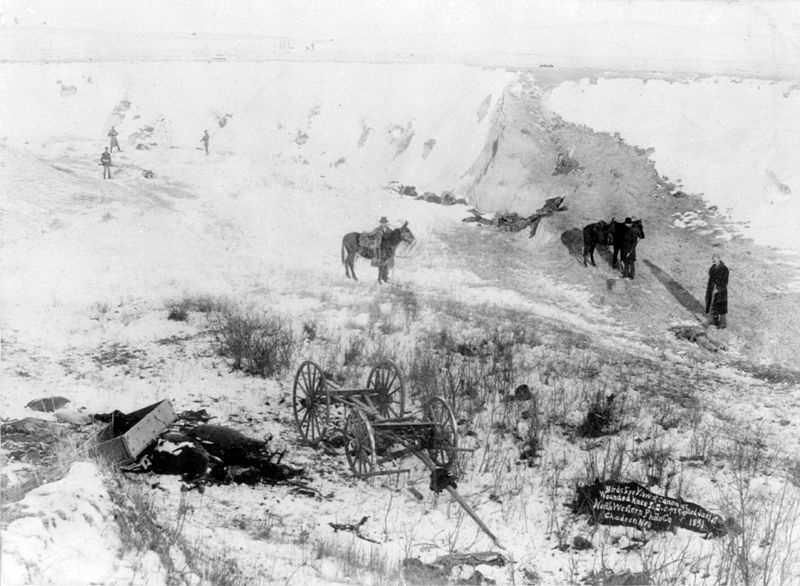 Although there is some debate regarding the casualties among women and children at the Washita, it is clear that at Wounded Knee many were hunted down and slaughtered. Four Irishmen died at each of these incidents. They may not be events which we wish to have as a focus of remembrance for the Irish in America, but if we want to gain a fuller understanding of Irish emigrant history and Irish nineteenth century history we need to study the Irish experience throughout this period. 28-year-old, 5 feet 8 inches tall former carpenter with blue eyes, brown hair and a sallow complexion. Enlisted in Brooklyn on 18th September 1890. Born in Co. Sligo. On his death he was owed $13.60 in backpay. 21 and a 1/2 year-old, 5 feet 7 1/2 inches tall former brass worker with brown eyes, black hair and a dark complexion. Enlisted in New York on 27th December 1887. Born in Co. Limerick. On his death he was owed $12.07 in backpay and $33.64 for clothing not drawn. 22-year-old, 5 feet 7 1/2 inches tall former laborer with blue eyes, red hair and a florid complexion. Enlisted in Chicago on 22nd April 1889. Born in Co. Waterford. On his death he was owed $24.95 for clothing not drawn. 25-year-old, 5 feet 9 inches tall former laborer with blue eyes, brown hair and a fair complexion. Enlisted in New York on 15th December 1889. Born in Co. Roscommon. On his death he owed $2.40 for clothing drawn. Another reason for studying the San Patricios that you don’t mention here is that while Irish who remained in the US army during the attack on Mexico were behaving in the same manner as their fellow native-born US soldiers, there was no comparable organized force of American-born defectors in the Mexican army similar to the San Patricios. In other words, Irish who stayed in the army were unremarkable, while those who defected were acting in a way that reflected a different identity. The fact that Americans do not view the Americans who fought in the invasion of Mexico as heroic, while at least among Mexican Americans the San Patricios are viewed as heroes, also has to be taken into account. Irish American endorsement of white supremacy and participation in the United States policy of genocide against Native Americans or land grabs from Latinos are not popular subjects. I think they are worthy of study, but certainly those who engaged in them should not be honored. You should also understand that in relationship to Native Americans, most of the genocide did not occur in battles or even massacres. The forced relocation, starvation, and cultural destruction by the army and other American institutions was the locus of the most harm. Frankly, these men engaged in grave human rights violations and wreaths should not laid upon their graves by the Irish president or anyone else. Thanks for the comment! That is a fair point with regard to the San Patricios. Although I know there is some debate regarding the reasons and motivations for their move to the Mexican side I think they are an extremely interesting group of men and are most certainly worthy of study and remembrance- particularly with regard to how they have been memorialised in Mexico. My larger point is following on from recent posts about the general failure in Ireland to study the Irish diaspora in any coherent way, and exploring the reasons why we don’t do that. The San Patricios fit a mould that resonates here, the Irish in the regular military tend not to. I don’t think many of the Irish involved in the U.S. military at the time of the Mexican War or in the ante-bellum period generally would have held strong views about the Mexican War either way- for the majority it was a case of economics. These are often the very same people who are commemorated in Ireland as Famine victims, yet we largely fail to study them after they left Ireland, despite the fact that they are a large block of our 19th century story. The histories of the Native-American peoples have long fascinated me, and I agree with your assessment with regard to this. I think it is time in Ireland we studied the Irish in all its forms in the 19th century U.S.- the good, the bad and the ugly- to try to gain a fuller understanding of what impacted on our emigrant population. There were large numbers of Irish involved in many unsavoury dealings in 19th century America. I agree our President should not be laying a wreath to Irish participation in wars against the Native-Americans (though one to the Irish of the American Civil War era wouldn’t go amiss!) but we certainly need to be doing far more study on these men and their families and we need to recognise it may be a complex story. The other point I was trying to get at was that many of these men were often victims themselves- recent emigrants who joined up and then found themselves on the Plains, for example- I don’t think it is mutually exclusive to have sympathy for them given their circumstances and also recognise how wrong the conflicts against the Native-Americans were. Few wars are heroic for anyone involved- I think that in Ireland we have to recognise that and do our best to understand those experiences. This article is a sad example of presentism. If you don’t know what that means, by all means dry your tears or pounding your breast or whatever you are doing and look it up. Thanks for the comment. I am aware of presentism- how do you feel it specifically relates to the points in the piece? I understand your point Damian and I support further study. As you know, I have written quite a bit on white supremacy among the Irish as well as Green on Black violence. In my course at Hofstra University on immigration law, I discuss the role of Irish immigrants in creating the Chinese Exclusion Acts and the support of many Irish for forging a white republic in the US that excluded blacks, Asians, and Native Americans. In this case, the Irish were not just “victims”, they were also “perpetrators”. In the 20th Century, Jewish Americans responded to anti-semitism by opposing all forms of discrimination. In the 19th Century, many Irish responded to the Know Nothings by pointing to other ethnicities and claiming they were more worthy of attack. In modern Irish America, no one talks about Father Coughlin or about the many Irish who supported Franco in Spain. Readers enjoy the stories of immigrants standing up for themselves. They are not so enamored of the immigrant as a member of a lynch mob. Quite honestly, I have spoken to many elderly Jews in New York who say that they were targeted by Irish neighbors for hate crimes in the 1930s and 1940s. I think it is something that should be researched before all the witnesses die. There would be a readership for the results among Jews, but how many Irish would buy a copy? The term ‘usable past’ is a good one in this instance and you have hit the nail on the head- it is only natural for people to look back at their own and draw on the inspiring and motivational rather than the less savoury aspects of their shared past. Of course for anyone seeking something approximating a historical truth it is necessary to face these questions (which is the reason behind this and other similar posts on the site)- be it in the 19th century or in the hate crimes you mention from the 30s and 40s. People are often products of their time and of their circumstances which are key drivers with regards to their outlooks- this was certainly a major factor with regard to the Irish of the nineteenth century. In terms of the U.S. military in the 19th century (outside of the American Civil War) is there room do you think for a broader remembrance of those who served in it (beyond just study), given the wide range of circumstances that led them to serve? Not all served in the Mexican or Native-American conflicts, but large proportions of them certainly did. From an Irish perspective I think we need to study and remember them as an emigrant group if for no other reason than there were so many of them- though as I was saying before not specifically for events like the massacre at Wounded Knee. To remember means to remember all aspects of their service, not just the good- currently in Ireland we don’t seem to remember at all. On a related note, it is interesting to me that Custer and his men at the Little Big Horn are often the focus of a lot of remembrance, principally because of the inherent ‘romance’ of the story and the fact that none of the men who rode in with him survived. Many of these men might just as easily have died on the Washita. I was struck when reading John Monnett’s excellent book on the Fetterman Fight and it’s background ‘Where a Hundred Soldiers Were Killed’, that the Powder River country where the fight took place had only recently been wrested from the Crow by the Lakota and Cheyenne by right of conquest. Of course, there is no comparison between this and the relentless persecution and suppression Native-American’s experienced at the hands of the Whites, but it did make me think about the complexities that were often at play. History is nothing if not nuanced! Damian, you asked: “In terms of the U.S. military in the 19th century (outside of the American Civil War) is there room do you think for a broader remembrance of those who served in it (beyond just study), given the wide range of circumstances that led them to serve?”. Study is good, but even in the US there is little/no remembrance of the peacetime army- native born or immigrant. Part of the problem is the tiny size of the army. In 1861 it had only 16,000 men. Another part is the mission. When General Lyons was out west before the war, his men slaughter 200 Indians including children, in order to bring three Indians involved in the killing of a couple of whites to “justice.” Apart from killing Indians and taking land away from Latinos, what did the Regulars do? Protect us from the Mormons? Roughly half the soldiers in the army in 1861 were immigrants, even though only about one in seven Americans was foreign born. The proportion was high enough that the Know Nothings wanted to ban immigrants from the army. However, the dirty little secret was that few right-thinking Americans wanted to join. Being a professional soldier, or “Regular” in the language of the day, was considered work beneath the honor of most native-born Americans. Soldiers led highly regulated lives in which they were not free to come and go as they pleased. They had to maintain tight standards of discipline under the threat of physical punishment for infractions. They were not free to take advantage of economic opportunities that might arise during their five-year terms of service. In other words, they were closer in status to slaves than to freemen. For new immigrants, particularly those who arrived penniless following the disastrous Potato Famine in Ireland, joining the Regular Army meant regular food and regular pay. They used the army as a landing ground in the New World and hoped that during their years in the Army they would have a chance to learn the ways of the United States and save money to buy land when they were discharged. However, while immigrants were a big story in terms of who served in the Regular army, army service was a small story within immigrant communities themselves because so few men served in the army. Out of 4.1 million immigrants in America in 1860, only 8,000 were in the army. By contrast, 500,000 immigrants served in the Civil War. In other words, while roughly 25% of immigrant men served in the Civil War, only .004% were in the prewar army in 1860. They are interesting insights into how the 19th century army is remembered in the U.S. today- I hadn’t realised they were viewed quite in that light. You are right with regard to the size of the regular army- although in terms of Irish military history the numbers who served in it during the 19th century are still highly significant particularly when taken together. There is no doubt they are only a tiny drop in the ocean with regards to the wider immigrant experience, but interesting nonetheless- it was a very popular choice of employment for Irishmen. From an Irish perspective we have expended far more time researching much fewer numbers of Irish in other military contexts. Naturally though it is important to view them within the wider emigrant experience. Their high degree of representation is also interesting to look at when you consider the relative under-representation (despite the huge numbers) of Irish-born in the American Civil War- the disillusionment prevalent after 1862 and factors such as the Emancipation Proclamation meant that the Irish did not serve in similar proportionate numbers to, for example, the Germans. Of course during the Civil War service represented far more than just a job and there were significantly more factors at play, such as personal ideologies and the risk of death. The one benefit of having such huge emigration in from Ireland in the 19th century is that it opens up a world of potential avenues of study! Thanks for the shout-out, Damian. As a South Australian I grew up with the stories of my 2xGreat Grandmother fleeing the “Great Famine” (Irish genocide) and the dispossession of their lands. Was quite a shock when “the penny dropped” and I saw how colonisation caused the poor, starving and dispossessed Irish to drive the Indigenous population from their Ancestral lands. It is not at all unusual to see that many of today’s Australian Aboriginal people carry the name of an Irish or Scottish forefather for these are the immigrants who pushed into the native lands to try and scrape a living from this harsh, inhospitable landscape. Many thanks for the comment and the insight. It is one of the tragedy’s of Irish immigration in the 19th century that it often led to the Irish playing a major role in the suppression of indigenous populations- certainly something we should be looking at more and seeking to understand in context. I just recently discovered that a distant ancestor of my own was transported to Australia so will have to try and see what became of her and what life might have been like. Many immigrants who just weeks before Ft. Sumter had been complaining about discrimination in America volunteered to protect a government they had voted against. Think of events in Libya in the spring of 2011. As rebel forces traded fire with Gaddafi loyalists, British, American, Italian, and Egyptian workers in Libya fled. The same scene has been repeated when civil wars have wracked the Balkans, Lebanon, Syria, and Egypt. Yet, tens of thousands of immigrants joined the Union army in 1861 and over the course of the war roughly half-a-million foreign born would serve. About a third were Irish-born. In comparison to Germans 1861 to 1865, the Irish were underrepresented, but in comparison with the general experience of the foreign-born in civil wars other than the American Civil War, they were fairly high in participation. I should clarify I mean under-represented purely in its statistical sense. Given the numbers of Irish who were living in the United States at the time if maximum mobilisation had been achieved there would have been more Irish in the war, but what we must do is explore the reasons as to a) why so many did serve and b) what may have prevented some from serving. I agree it is remarkable that so many served, particularly given the Know-Nothing sentiment that was experienced in many parts of the U.S. and particularly in States such as Massachusetts. I think it is harder for us today to understand why the Irish fought for the North given the circumstances (in contrast to the perceived motivations of the Irish in the South, for example). It is a topic I explore in the book to try and learn why it was so many did end up enlisting (particularly at the commencement of the war). I would view the main ideological motivation as being a desire to preserve the Union, which was important to the Irish for a number of reasons. Despite their hardships many had bought-in to the idea of the United States as well, a motivational factor not to be underestimated. Great post. Very thought provoking. I’ve always believed that Major Myles Moylan was really born in Ireland, as he originally attested during his first six years in the Army. Many thanks- I enjoy reading your site on the topic. That is interesting regarding Moylan, it seems to have happened quite a bit where men would alter their birth location to suggest they had been born in the States. Photographer Timothy O’Sullivan seems to have done it (his father claimed he had been born in Ireland) and of course there is the never-ending was he/wasn’t he debate that surrounds Phil Sheridan. I find it interesting that all those names listed killed in Washita all enlisted between July and September 1866. These men were certainly not experienced having just a little over two years and none were veterans of the Civil War. Probably their first and sadly last combat experience. You have to wonder how much that played into their sad demise. May they all Rest in the Peace of God. I agree- many of these men were not long off the boat. It must have been an incredible culture shock to have come from rural Ireland, enlist in the army and then find yourself on the Plains fighting the Native Americans within such a potentially short space of time. I heard a presentation at the American Conference for Irish Studies-West 2014 meeting about this question. The professor concluded that the question of whether the Irish in the West sympathized with the natives or with the “whites” due to the Irish situation itself was not clear. Instead, individual leanings came into play, with little direct sympathy at least in the historical record being made by many Famine emigrants serving towards the natives they encountered. While those equating the native to the Irish circumstances were not absent from the record, it seems most (silent majority?) served, shut up, and followed orders. Thanks for the comment. I would like to have been at that for the discussion. I think the majority of Irish emigrants would have felt they have very little in common with Native American peoples, and would have followed the general dominant view at the time with respect to them. I have not come across anything for example to suggest the Irish viewed the Native Americans in any better light than they tended to view African Americans. Of course this can never be a blanket statement, but it certainly is an intriguing area of study.